Its lazily-flowing, murky, pea-green water has a strong organic smell to it as fallen tropical vegetation floats along its surface. Fish jump in one’s peripheral vision. Circular ripples near the shore signal the presence of small insects to the birds perched directly overhead, ready to dive and devour. Clumps of dead wood have washed ashore making a stable home for the various-sized iguanas sunning themselves. They move only when someone throws out an occasional fresh vegetable scraping onto the nearby bank. Long, slender, distinct one-inch diameter branches protrude vertically 20’ to 30’ downward before splitting into broom-like clusters of ten sub-branches, arcing like an umbrella, to root into the soil. 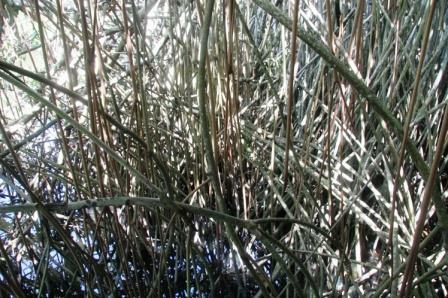 Masses of these form and intertwine, creating an impenetrable thicket between the bank and the water. Only the delicate butterflies and birds can navigate among the twists and turns of this jungle they create. There is no escaping the intensity of the scorching heat on the breezeless canal-like body of water that parallels the ocean. Twenty thousand hectares of mangrove forest lie along this coast making it Central America’s largest of its kind. But fragile and declining strips of forest along El Salvador’s Pacific Coast are being threatened. 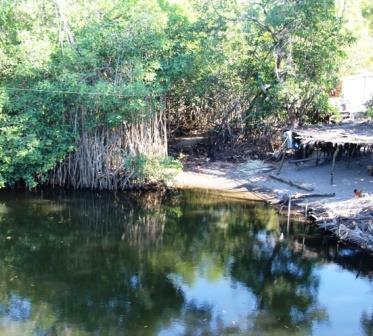 The mangroves serve a valuable ecological purpose. They provide a natural buffer during the extreme weather events which the country is prone to. The stilt-like roots protect the area from flooding and rising tides. El Salvador has no levee system and so powerful storms become catastrophic quickly. This over-populated country has been pushed out to its coastlines. Many of the people are unaware of the vital role mangroves play along the coast and will cut down the trees to use for firewood. In the past entire areas were cleared to plant cash crops. In recent years locals have been noticing that large areas of mangroves are dying. Climate change is blamed for this because as the sea rises (21cm in last century) due to melting polar caps and glacial melting, the ocean has moved across the land to the mangroves, taking with it the nutrients from the soil that sustains them. When the trees die, all forms of animal habitat leave. The other threat to the mangroves is tourism. Being located along the ocean means they are at risk of developers destroying them to build resorts. Foreign investors tend to have little regard for the local environment or ecosystem. These areas also happen to be home to endangered sea turtles coming to nest each year. The human factor is huge along these narrow slivers of land which are hanging on by a thread. Local fishermen have lived here and fished these waters for generations. I’ve watched young boys in rowboats traverse the mangrove waterways. At wide points they will throw out a net and then quickly pull it in. In narrower places they will sink a line to the bottom to crab. Catch is meager, but mouths to feed are many, and they are able to sustain themselves and their families. I shudder to think what will happen if the mangroves disappear as a result of the combination of climate change and unregulated tourism. Dr. Ricardo Navarro, director of the Centre for Appropriate Technologies in El Salvador, projects that the next group forced to migrate out of the country will do so as a result of climate change. 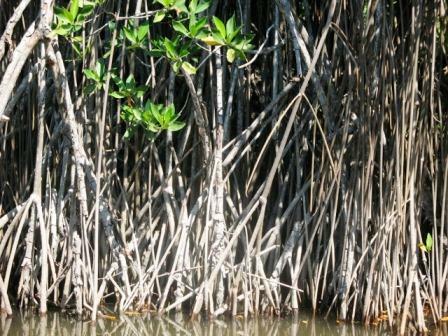 The mangroves have played a key role in the ecosystem on the coastlines in this area for many, many years. I hope that by carefully studying and assessing those small areas of dead mangroves, proactive efforts can be made to protect the larger sections of mangroves so El Salvador will be able to save them. Those who live in this area will need to learn how to encourage conservation techniques. They will also need to adapt their housing to the frequent flooding that occurs. This is clearly demonstrating recognition by this organization of the vulnerability and value of these shorelines.